LE FORMAT DE PLUS EN PLUS MONSTRE. English: THEY GET BIGGER AND BIGGER. - Our newspaper announces that in order to please the subscribers, they will soon increase the format of the paper. - My God, is that still possible? - I’m afraid, by God, it is! 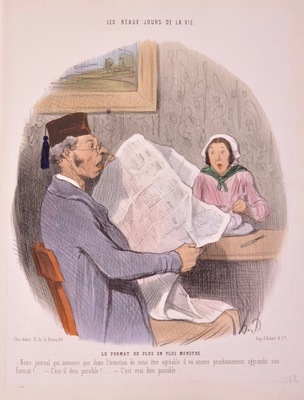 While the subject satires trends of the time to please readers by expanding newspaper formats, Daumier’s print was made during an era when censorship laws prohibited his earlier tendencies to launch scathing attacks on the monarchist regime of Louis Philippe.